Investors’ concerns towards emerging and frontier markets remained high last month due to continued macroeconomic and political uncertainties in larger frontier and emerging markets such as Argentina and Turkey whose equity markets and currencies saw a major correction. 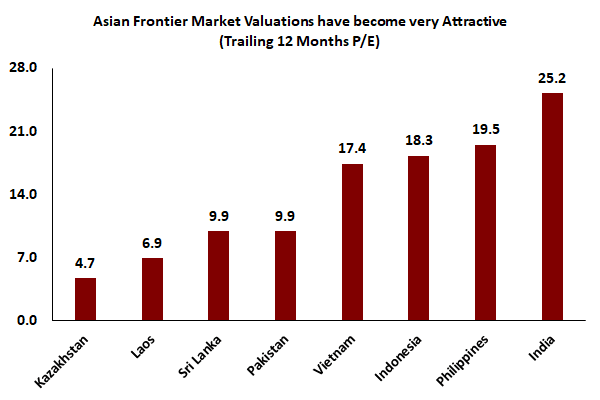 However, the economic and political outcomes in either country are not linked to the fundamentals of Asian Frontier markets and this was reflected in fund performance where both the AFC Asia Frontier Fund and AFC Vietnam Fund ended the month in positive territory while most major emerging and frontier indices witnessed a steep correction. Though sentiment has been hurt by global events, Asian Frontier markets continue to remain a structural growth story driven by favourable demographics, improving infrastructure, increasing urbanisation, rising income levels, greater consumerism and structural changes such as manufacturing jobs moving to Bangladesh, Cambodia and Vietnam, none of which are expected to change despite the near-term uncertainties, some of which are unrelated to Asian Frontier markets. More importantly, valuations across our universe are now at very attractive levels while fundamentals on a company level remain sound. In addition, the trailing twelve-month P/E of the fund at 13.24x is now 30% lower than the P/E multiple of 18.8x that it reached in January 2017. This is also a reflection of the value of the stocks in the fund’s portfolio and we continue to see opportunities at attractive valuations across our universe post the recent correction. We remain invested in companies that have structural long-term growth stories and which have gone through various up and down cycles previously. 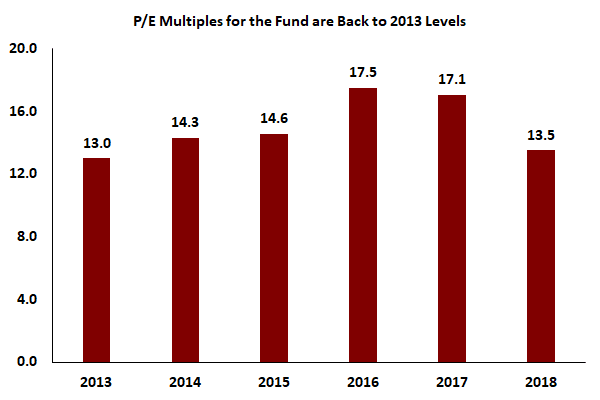 Furthermore, the fund’s P/E multiple at 13.24x is back to levels last seen in 2013 at which time markets were in a similar period of uncertainty and after which the next calendar year (2014) had very strong returns for the fund. 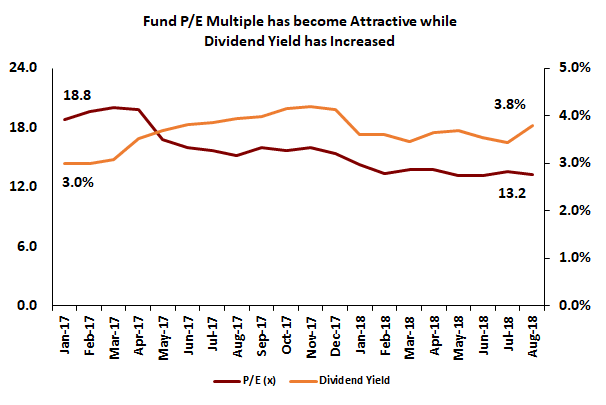 The dividend yield of the fund has also improved over the past eighteen months to 3.8% compared to 3.0% in January 2017, which reflects the cash-generating abilities and dividend payout ratios of the fund’s portfolio companies. The American University of Iraq in Sulaimani (AUIS) appointed our AFC Iraq Fund CIO as Adjunct Assistant Professor. He will teach there part-time, as part of his research into sustainable post-conflict economic growth. He started this research last year when he joined the Institute of Regional and International Studies (IRIS) as a fellow. This institute is a research arm of the university. More information is available on the AUIS Website. The AFC Asia Frontier Fund (AAFF) USD A-shares gained +0.7% in August 2018. The fund underperformed the MSCI Frontier Markets Asia Net Total Return USD Index (+0.9%), while it outperformed the MSCI Frontier Markets Net Total Return USD Index (−5.4%), the AFC Frontier Asia Adjusted Index (−1.3%) and underperformed the MSCI World Net Total Return USD Index (+1.2%). 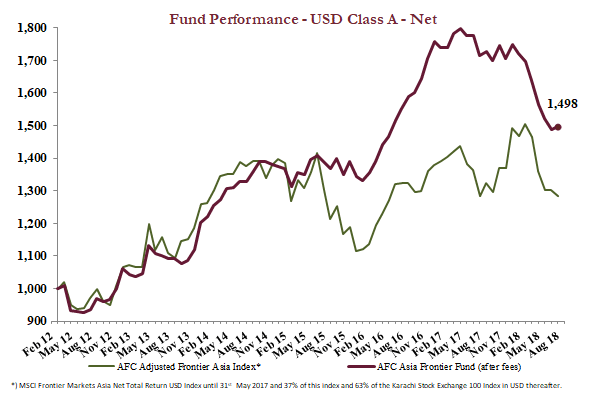 The performance of the AFC Asia Frontier Fund A-shares since inception on 31st March 2012 now stands at +49.8% versus the AFC Frontier Asia Adjusted Index, which is up +28.5% during the same time period. The fund’s annualized performance since inception is +6.5% p.a., while its YTD performance stands at −12.2%. The broad diversification of the fund’s portfolio has resulted in lower risk with an annualised volatility of 9.10%, a Sharpe ratio of 0.67 and a correlation of the fund versus the MSCI World Net Total Return USD Index of 0.33, all based on monthly observations since inception. 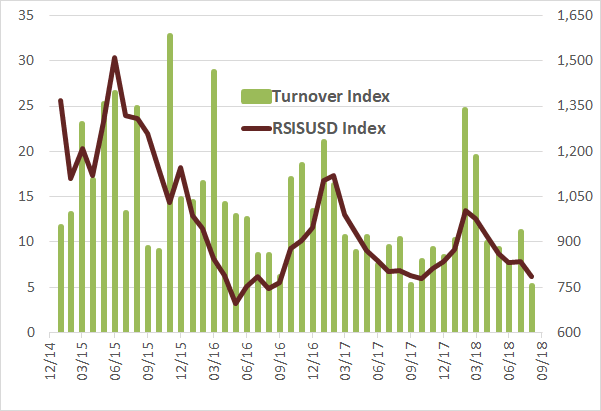 Investor sentiment within frontier and emerging markets was subdued as macro concerns regarding Argentina and Turkey remained elevated, leading to a selloff in both of these countries’ equity markets and currencies. This led to a negative spillover amongst frontier and emerging markets in general. However, aside from sentiment, Asian frontier markets are not fundamentally linked to the economic or political outcomes in Argentina and Turkey and this was reflected in both fund and stock market performance this month with the fund showing a positive performance despite issues in other larger frontier and emerging countries. Economic growth prospects for Asian frontier markets remain strong along with sound company fundamentals while valuations across our universe have become extremely attractive and none of the countries in our universe face the issues on the scale that some of the larger frontier and emerging markets are facing. Performance this month was led by Bangladesh, whose market saw a rebound especially in banking stocks which have been weak so far this year due to worries over margin pressures. Despite the issues, some of the well-established private banks declared stable quarterly results which led to a rally in the sector with the fund’s bank holding gaining 17.2% during the month. The fund’s largest holding, a pharmaceutical company with the third highest market share in Bangladesh, was a major positive contributor to performance. The GDR listed in London which the fund holds gained 14.5% during the month and it continues to trade at a significant discount of 32% to the local listing in Dhaka whilst growth prospects for the company remain sound due to the growing healthcare consumption in Bangladesh where per capita health expenditures are amongst the lowest globally. The Vietnamese market also witnessed a recovery with the VN-Index gaining 3.5% but this was led by a few large cap state-owned banks (which remain under-capitalised) and PetroVietnam Gas. However, the fund’s Vietnamese holdings did well despite not having exposure to the above-mentioned companies. The recent investment in an automotive holding company at a very attractive valuation of a trailing twelve months P/E of 6.0x was reflected in this month’s performance. The stock rallied by 30.2% due to good quarterly results and growth was mainly led by its associate investment, Honda Vietnam, whose motorbike volumes grew by 10% YoY in 1H18 compared to industry growth of 4%, while its net profits grew by 38% during the same period. 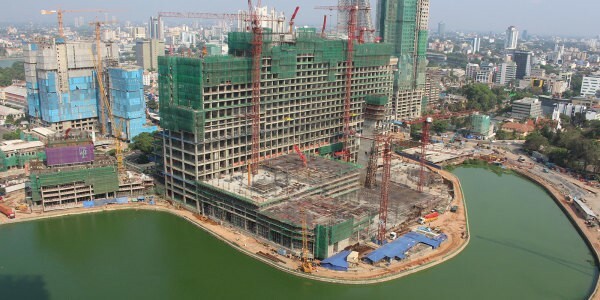 The fund’s other Vietnamese holdings which did well were a construction company (+12.4%) which trades at a trailing twelve-month P/E of 8.1x and has 36% of its market cap as net cash with zero debt, and a consumer conglomerate (+12.8%) whose feed business should see an improvement in profitability going forward due to a big recovery in pork prices while its consumer staples business continues to do well. 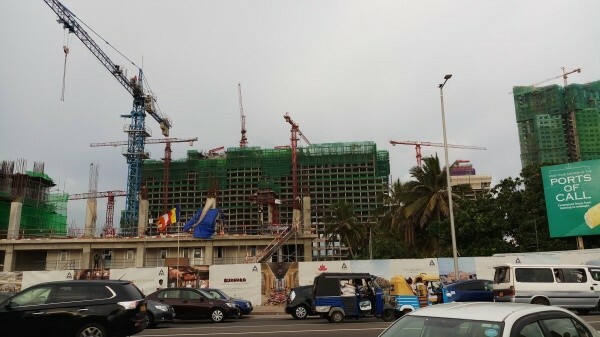 On a macro level, the State Bank of Vietnam (SBV) is looking to rein in credit growth for the rest of the year as inflation came in above the 4% target in June and July while softening slightly in August to 3.98%. Higher food and fuel prices have led to this increase in inflation which has resulted in the SBV planning to not allow banks to increase their loan growth quotas for the rest of the year which could lead to lower credit growth for banks in the second half of 2018 given that loan growth in the first half was very strong for most banks. Investors in Pakistan await further plans and announcements from the new government with respect to tackling the current account deficit and low foreign exchange reserves but with no major announcements on this front, the market remained weak. Despite this, fund performance did not suffer thanks to both reduced exposure as well as good quarterly results from a car manufacturer and fuel retailer which the fund holds and whose stocks did well during the month. Both stocks trade at attractive valuations with trailing twelve-month P/E’s of 8.3x and 9.2x respectively and both companies have business models which generate free cash flows on a consistent basis with net cash as a percentage of market cap for each company at 45% and 11% respectively with zero debt. Further, the car manufacturer has also announced an expansion plan which will increase capacity by 17%. Though economic growth is expected to slow down next year, we are seeing greater value in Pakistan as trailing twelve-month P/E multiples across most companies and sectors are less than 10x, while on the company level fundamentals remain stable. 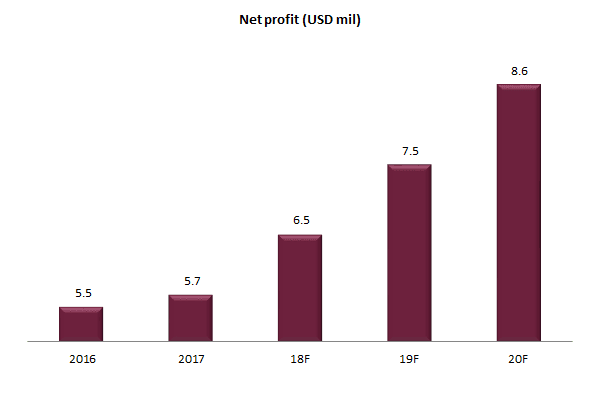 In Sri Lanka, the fund’s largest holding in the country, a telecom company, declared good quarterly results led mainly by strong growth in its mobile data and fixed broadband business which grew by 34% and 39% YoY respectively in 2Q18. However, despite the good results and attractive valuations, the stock weakened due to policy changes announced by the government. The government plans to follow through on its telecom tower tax announced in last year’s budget but on a more toned-down version which will lead to an estimated 3% impact on the company’s net profit which is not severe. The telecom regulator also announced removal of the floor price rules for voice calls which has led to a fear of price cuts leading to a decrease in voice revenues and this resulted in a 15.5% correction in the stock price this month. 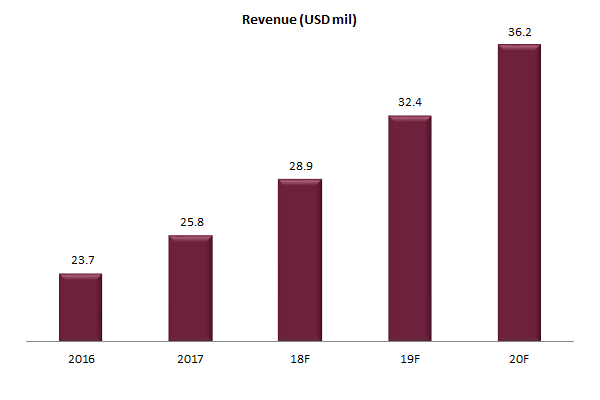 However, voice revenues for the company and the industry in general have been soft over the past few years with most of the growth being driven by data and broadband which is the company’s strength due to its network coverage across the country. Further, with the fund’s holding being only one of the two profitable telecom players in a five-player market, the sustainability of any price competition in the voice business is questionable and with industry consolidation expected to lead to an oligopolistic market, larger players such as the company which the fund holds should benefit in the long run. The stock continues to remain very attractively valued at a trailing twelve month P/E of 7.9x and EV/EBITDA of 3.9x, a significant discount to other regional players in a similar competitively advantageous position. Mongolia made a positive contribution to performance this month due to very good results from the fund’s cashmere manufacturer and retailer which led to this company’s stock price increasing by 24% while a coal producer the fund holds began to see increased shipments to China as the border transportation issues have been resolved to some extent, leading to a 26.1% gain in this stock for the month. The best performing indexes in the AAFF universe in August were Bangladesh (+5.6%), Vietnam (+3.5%) and Mongolia (+1.5%). The poorest performing markets were Iraq (−5.9%) and Kazakhstan (−5.8%). The top-performing portfolio stocks this month were: a Vietnamese automotive holding company (+30.3%), a Mongolian coal company (+26.1%), a Mongolia cashmere producer and retailer (+24.0%), a junior copper miner from Mongolia (+20.0%), and a junior oil & gas company from Papua New Guinea (+19.4%). In August, we added to existing positions in Kyrgyzstan, Mongolia, and Vietnam. We started to invest in Uzbekistan for the first time in the fund’s history and added 10 names mainly from the financial, industrial, and materials sectors. Though 10 names sounds like a lot, given the lower liquidity in this market, we are looking to build a basket of positions and are one of the few institutional investors in the country after it has opened up again over the past eighteen months. We exited a taxi company in Vietnam, a tobacco and construction company in Sri Lanka, and a logistics company in Pakistan. We partially sold one company from Bangladesh, three companies in Mongolia, and one company in Pakistan. As of 31st August 2018, the portfolio was invested in 113 companies, 1 fund and held 8.0% in cash. The two biggest stock positions were a pharmaceutical company in Bangladesh (7.2%) and a pump manufacturer from Vietnam (4.0%). The countries with the largest asset allocation include Vietnam (25.0%), Bangladesh (18.7%), and Mongolia (17.5%). The sectors with the largest allocations of assets are consumer goods (28.4%) and industrials (17.6%). The estimated weighted average trailing portfolio P/E ratio (only companies with profit) was 13.24x, the estimated weighted average P/B ratio was 2.46x, and the estimated portfolio dividend yield was 3.80%. 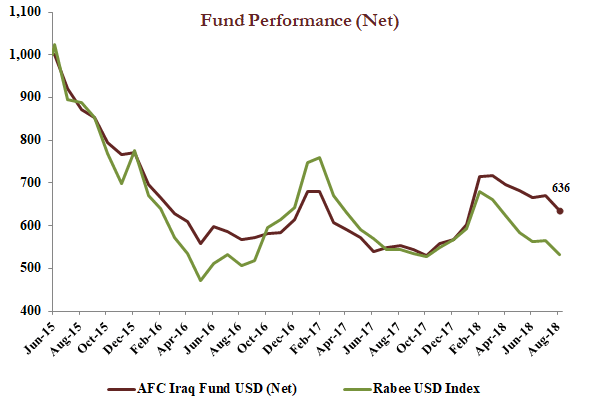 The AFC Iraq Fund Class D shares returned −5.4% in August with a NAV of USD 635.54 which is an out-performance versus its benchmark, the RSISUSD index which was down −5.9%. Year to date the AFC Iraq Fund Class D shares are up +12.0% versus a loss of −6.0% for the RSISUSD index. The market followed through with its longer-term bottoming process as the July interim bottom was tested this month. After having rallied 14.5% in July from an important technical level, August saw a retest with the index retracing to 6-8% above it. Trading volumes have been low (see chart below) with August being the hottest month of the year and the peak of the summer holidays. This year it coincided with the Eid holidays, the continuation of the demonstrations that began in July and the prolonged uncertainty over the government formation – all of which put the market’s action in perspective. From a longer-term perspective, the current test of the July bottom is part of a much larger bottoming process, in which the index is testing the major multi-year low made in May 2016. Given the significantly improving macro picture for Iraq, the most likely outcome is for a continuation of the bottoming process, with the uptrend’s timing highly dependent on the return of liquidity into the broader economy. The thesis of the return of liquidity is supported by the latest budget data from the Ministry of Finance showing a budget surplus of about USD 12.5bn for January-June 2018, which argues for a year-end surplus higher than the USD 18.8bn that was argued for here a few months ago. The variance is driven by higher oil prices and exports than assumed earlier. Based on data showing an average price of about USD 65.5/bbl for January-August 2018, and the direction of oil prices, it would be reasonable to assume that the average Iraqi oil price in 2018 could be higher by USD 3-5/bbl. Coupled with higher oil exports, they would imply a year-end budget surplus of potentially USD 24.5bn - equal to about a 19% stimulus for the non-oil GDP versus the earlier estimated 14.5%. Supporting this line of thinking is the gradual appreciation of the market price of the USD versus the IQD over the last few weeks. This premium has been range bound between about 1.5% to over 2% over the few weeks, after hitting lows of around 1.2% in June. This is likely to be a function of a recovery of government spending and a tentative recovery in consumer spending with the resultant increase in demand for imports – it should build on the first signs of this recovery as seen by the 13% year-over-year increase in imports in 2017 as the chart below shows. The link between the market price of the USD versus the IQD and recovery in consumer spending is a result of the dollarization of the economy, in that the strength or weakness of the IQD is a function of the demand-supply balance for USD, and not a specific USD weakness or strength. While this could be due to the re-imposition of the sanctions on Iran and the likely higher demand of USD, as argued in “Iran, Sanctions and Iraq: The Bigger Picture”, this is unlikely given that Iran’s access to the USD was severely restricted following the signing of the JCPOA. As such, there is no reason to expect that the re-imposition of sanctions would change things much, and thus the most likely explanation is increased demand for imports due to a tentative recovery in consumer spending. Further recovery in consumer confidence, once liquidity returns, should lead to higher imports, which in turn should lead to an increase in the premium of the market price of the USD over the official rate to a range of 2-4%, if not higher. 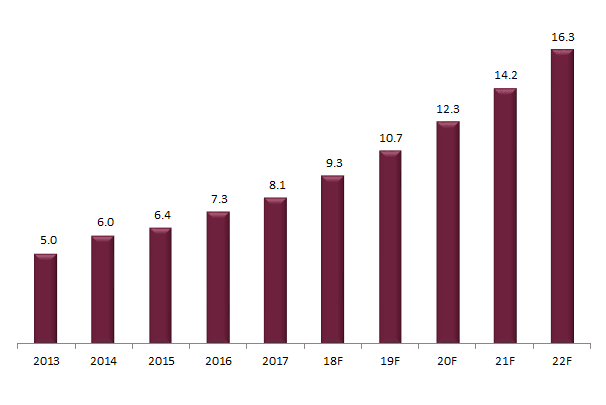 For commercial banks’ earnings, this means a recovery in trade finance revenues and increased FX margins, which with improvements in deposit growth and quality of loans should imply a resumption of earnings growth. However, this improving outlook is yet to be discounted by the market. While all stock markets are a discounting mechanism, they need data to discount. Local trading on the Iraq Stock Exchange (ISX) is dominated by speculators, who tend to appreciate the true values of local assets especially at extreme valuations. However, their discounting mechanism is mostly a rear-view mirror extrapolation of the prior negative trends into the future and thus would not have considered this potential change in fortunes for the banking sector. 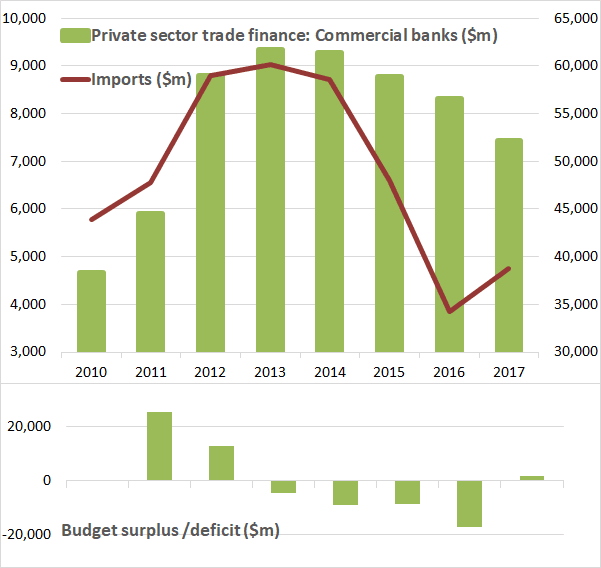 The chart above shows the trends over the last few years in commercial banks' trade finance revenues, Iraq’s imports, and the link to government budget surplus/deficit - given the centrality of the government's role in the economy. As can be seen from the chart, the improved imports have yet to translate to a recovery in trade finance earnings for the banks. This continues to underscore the opportunity to acquire assets that have yet to discount a full economic recovery. As of 31st August 2018, the AFC Iraq Fund was invested in 14 names and held 2.9% in cash. The fund invests in both local and foreign listed companies that have the majority of their business activities in Iraq. The markets with the largest asset allocation were Iraq (95.9%), Norway (3.2%), and the UK (0.9%). The sectors with the largest allocation of assets were financials (49.4%) and consumer staples (21.0%). The estimated trailing median portfolio P/E ratio was 12.06x, the estimated trailing weighted average P/B ratio was 0.87x, and the estimated portfolio dividend yield was 7.73%. 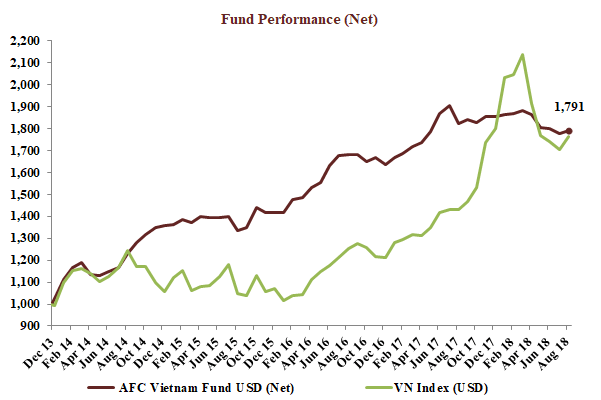 The AFC Vietnam Fund gained +0.8% in August with a NAV of USD 1,791.39, bringing the return since inception to +79.1%. This represents an annualised return of +13.2% p.a. Due to the heavy weight of banking stocks The Ho Chi Minh City VN Index in USD gained +3.4%, while the Hanoi VH Index added +6.2% (in USD terms). The broad diversification of the fund’s portfolio resulted in a low annualized volatility of 8.69%, a high Sharpe ratio of 1.45, and a low correlation of the fund versus the MSCI World Index USD of 0.23, all based on monthly observations. International investors are still focused on the political friction and trade tariffs between the USA and – let’s call it a growing number of countries around the globe. People are now mainly concerned about the impact on those countries involved, but at the end of the day global trade and growth as a whole will be negatively affected. Currently, people still feel safe in US assets including the USD but are dumping assets from struggling countries such as Turkey, for example. Countries like Vietnam are, at least for now, not being negatively impacted, similar to most countries in the west, but people still fear a contagion effect similar to that which occurred during the Asian crisis 20 years ago, although economic conditions and the level of development are not comparable. The emerging market crisis of the 90’s was mainly caused by a misallocation of capital and an unhealthy combination of current account and trade deficits, as well as low currency reserves and overvalued currencies, none of which are the case for most countries in Asia today. In fact, the exact opposite is the reason for Trump’s aggressive foreign economic policy which makes investors feel uneasy. High trade surpluses and an accumulation of USD assets over the past 10-20 years in countries like China are leading to fears that an increasing number of countries will have trade surpluses with the USA, and hence could become a target of US trade sanctions, including Vietnam. Vietnam is a smaller, but growing exporter to the USA, although its exports to Asian countries still dominate with a share of around 48%. 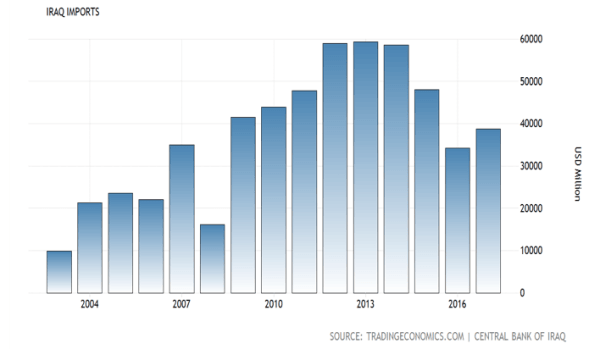 Vietnam has a very small economy on a global perspective, but its currency reserves have improved significantly over the past few years, reaching over USD 60bn even though the trade balance is currently only around 1-2% of GDP, which seems to be low when compared for example to Germany where the balance is around 8-9% of GDP. The fact is that the world economy has changed a lot over the past 20 years since China’s economy really took off and it can be taken for granted that Trump will not be able to change the rise of Asia. 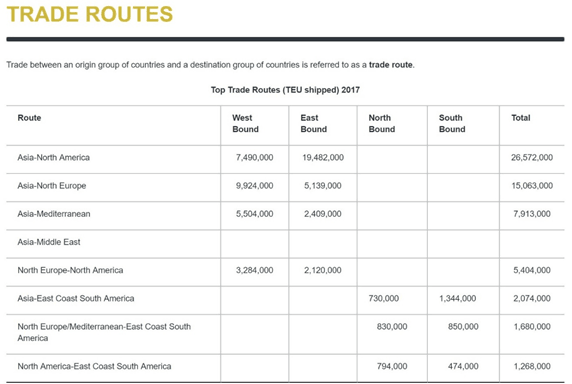 Almost all of the top ten ports in the world are located in Asia and the main trade routes are now going out of Asia. With recent tariffs, Trump is merely accelerating the obvious trend away from a cooperating western economic block with (North) America and Europe including Russia and Turkey, which would be better able to stand up against a rising Asia. 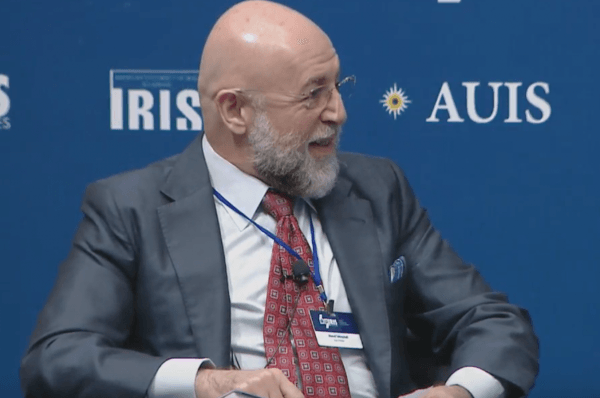 Contrariwise, we now see a weakened central Europe and a stronger economic block building between China, Russia, and countries in the southeast of Europe. It is questionable that this is really in the long-term interest of the USA. For the time being, Vietnam is seen as an external port for Chinese goods. With lower duties out of Vietnam, trade should increase and be shielded from somewhat lower global trade. The main beneficiaries would be ports and the logistics industry in Vietnam. We’ve always been bullish on the outlook for stronger exports in the long term but are puzzled by the very cheap valuations of many of those companies where we see a lot of potential for the future. One good example is Da Nang Port, a hidden growth story. This company is the largest port operator in Central Vietnam, which has a total population of more than 20 million people. Da Nang Port was founded by the French in 1901 as an important military port for the French Army and was one of the first ports in Vietnam. After the liberation, Da Nang Port became a commercial port under the control of the Vietnamese government. With a 113-year history, Da Nang Port listed on UPCOM in 2016 and is now trading on the Hanoi Stock Exchange. 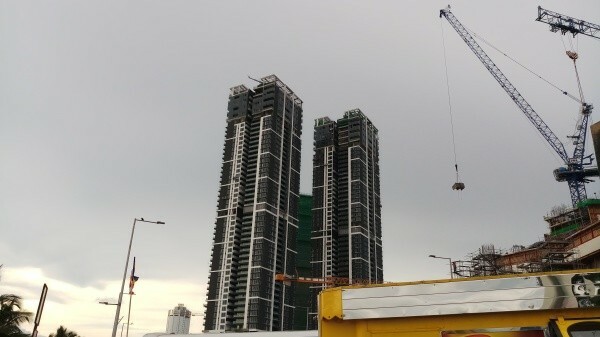 Vietnam has three important economic and social regions - The North, South and Central, with Da Nang City being the most important town in the Central region. Most exports from this region are handled through the port of Da Nang, which has an annual capacity of 8 million tons/year. Due to its important role and geographic location, Da Nang port has had steady and impressive growth over the last 5 years. 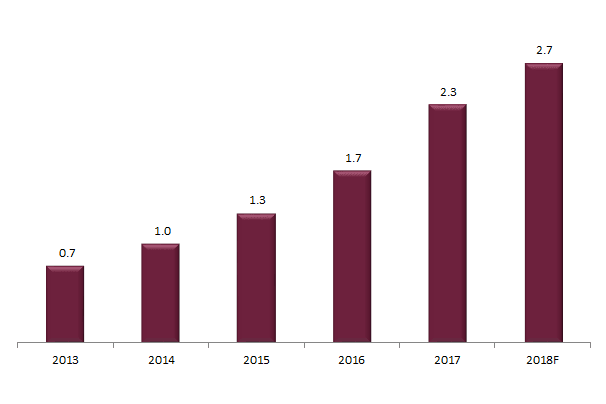 Total cargo volume increased from 3.8 million tons in 2011 to 8.1 million tons in 2017 and is expected to grow to 10 million tons by 2020, a CAGR of 13%. The container (20 foot) volume increased from 114,000 in 2011 to 360,000 in 2017, a CAGR of 22%. At the end of July 2018, Da Nang Port completed its sub-port expansion, Tien Sa Port, to increase the total capacity of the company to 12 million tons of cargo. 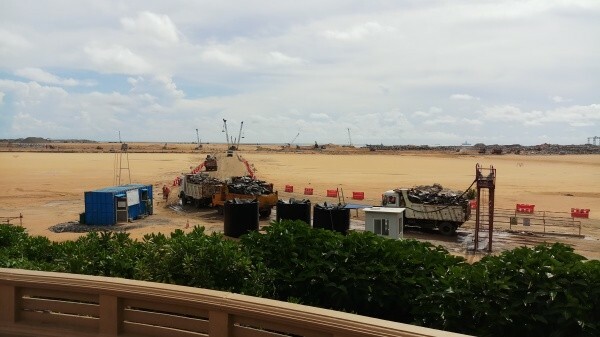 This expansion was needed in order to handle the company’s expected growth of around 15% per annum over the next 5 years. 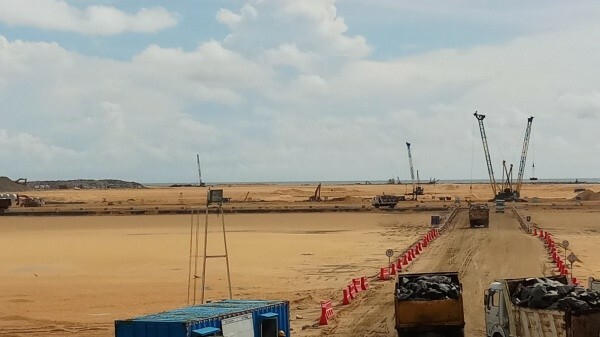 But for its long-term future, Da Nang Port has already planned to build another port in Lien Chieu District, which is expected to be completed by 2025. On the other hand, Da Nang is one of the most attractive travel destinations in Vietnam, with beautiful beaches and many other attractions. Also, the recent APEC meeting which was held in 2017 created a lot of international attention. International visitors are expected to reach 2.7 million in 2018, an annual growth rate of 30% over the past 5 years. Cruise ship arrivals in Da Nang have also doubled in the first 7 months of 2018 to more than 70 ships, mostly from China. Da Nang Port Company is an undervalued stock with a hidden growth story. When it first listed its shares on UPCOM in 2016, most investors did not notice it, neither did it garner any attention when it up listed to the Hanoi Stock Exchange in 2018. We attribute this mainly to the current environment where small and mid-caps are mostly ignored. In the last 5 years, total revenue and operating profit of Da Nang Port were up strongly. The stock is trading at a PER of 10 and a P/B ratio of 1.2. 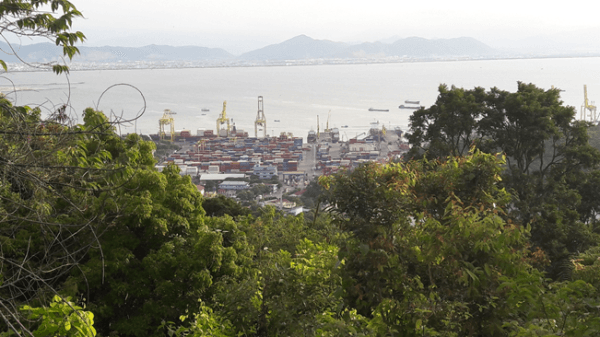 With a bright outlook and a solid balance sheet, Da Nang Port is one of many hidden gems in our universe. FDI disbursement in the first 8 months hit USD 11.25 billion, gaining by 9.2% y-o-y. Solid FDI disbursement should help reduce pressure on FX rates. Exports and imports keep growing strongly at 14.5% and 11.6%, and are targeted to reach USD 155.4 billion and USD 152.7 billion, respectively. The trade surplus gained USD 2.8 billion in the first 8 months of this year. CPI slowed down in August to 3.98% from last month of 4.46%. At the end of August 2018, the fund’s largest positions were: Agriculture Bank Insurance JSC (4.1%) – an insurance company, Sametel Corporation (3.4%) – a manufacturer of electrical and telecom equipment, Vietnam Container Shipping JSC (3.0%) – a container port management company, Global Electrical Technology Corporation (2.2%) – an electrical equipment company, and TanCang Logistics and Stevedoring JSC (2.2%) – a logistics company. The portfolio was invested in 72 names and held 4.0% in cash. The sectors with the largest allocation of assets were consumer goods (32.2%) and industrials (32.1%). The fund’s estimated weighted average trailing P/E ratio was 9.68x, the estimated weighted average P/B ratio was 1.53x and the estimated portfolio dividend yield was 7.37%.